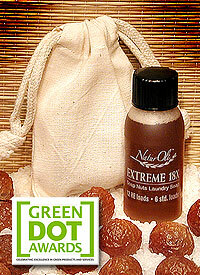 Would you like to try Organic Soap Nuts & Extreme 18X? Here is a little sample of each! Included in this sample package is a heavy-duty muslin wash bag with enough soap berries for about 5 loads of laundry, and a 1-oz. trial size of Extreme 18X soap nuts liquid concentrate - enough for 12 High-Effeciency laundry loads or about 6 standard washing-machine laundry loads. A pocket-sized 8-page pamphlet with details on how to use soap nuts is included in every order. Already enjoy using soap nuts? Share a trial-sized pack with some of your friends as a little gift!